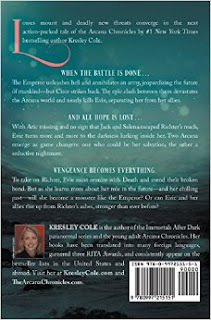 Blurb Description: Losses mount and deadly new threats converge in this next action-packed tale of the Arcana Chronicles by #1 New York Times bestselling author Kresley Cole. When the battle is done . . . The Emperor unleashes hell and annihilates an army, jeopardizing the future of mankind--but Circe strikes back. The epic clash between them devastates the Arcana world and nearly kills Evie, separating her from her allies. And all hope is lost . . . With Aric missing and no sign that Jack and Selena escaped Richter's reach, Evie turns more and more to the darkness lurking inside her. Two Arcana emerge as game changers: one who could be her salvation, the other her worst nightmare. Vengeance becomes everything.To take on Richter, Evie must reunite with Death and mend their broken bond. But as she learns more about her role in the future--and her chilling past--will she become a monster like the Emperor? Or can Evie and her allies rise up from Richter's ashes, stronger than ever before? And then, book two, Endless Knight here, followed by book three - Dead of Winter here. I knew this day would come, but I had no idea it would be here so soon. I have pretty much binged this entire series in a couple of weeks, and at the beginning, I had no idea that I would be here, and in love. The Arcana Chronicles is based on a game with life and death stakes. Every few centuries, a chosen twenty two reincarnated souls battle it out to be the winner, and claim immortality as their own. These twenty two Major Arcana have been gifted special powers by the old gods and are based on Tarot Cards. How do you win? Well, you need to kill everyone else. In this game, an alliance has been formed. One that vows not to kill, but to live their lives out as mortals not immortals. But in a game based on killing, and trust severed to almost nothing over the millennia, can the Arcana stay in the light? After the unique storyline, I completely fell for the characters. There’s so much about these people that you can love, and so much of them to be exasperated about in a post-apocalyptic world, but most of all they feel SO REAL, you cannot help but fall and root for them to JUST BE HAPPY. Evangeline Greene is the Empress – she can make and grow plants and also poison using them. In a world with no food or plants, her skills are invaluable. After surviving the start of the apocalypse with her mother, who then passed away, she continues from her home with Jackson Deveaux to get to her grandmother, who is a Tarasova, or a chronicler of the game. On the way she meets other Arcana and learns about the game. There’s Selena Lua (The Moon), Lark (Fauna), Matthew (The Fool), Finn (The Magician), Aric (Death), Gruthie (The Heirophant), Vincent and Violet (The Lovers) and others with THE COOLEST (and scariest) POWERS EVER. I can’t explain why I love this series in words – but IT IS AWESOME. This will make you love characters you swore never to love, it will make your ships sink and then fly, it will make your heart break and then fix it together again. Set in a brutal background, The Arcana Chronicles is a masterful work of art. I am broken, I am past tears, but somehow I’m also ridiculously happy – is this what love feels like? – and I am so SO ready for book five. Blurb Description: Arcana means secrets, and these Arcana Chronicles short stories from #1 New York Times bestselling author Kresley Cole are filled with them. Experience firsthand the beginning of the end and behold the apocalypse through the eyes of characters you onlythought you knew. Ashes to ashes . . .Evie Greene’s story of the Flash is just one of many. All over the world, those connected in some way to the lethal Arcana game—like Death, Jack, and Fortune—must first survive a horrifying night of blood and screams. We all fall down.Some will have to grapple with new powers; all will be damned to a hellish new existence of plague, brutality, desolation, and cannibalism. 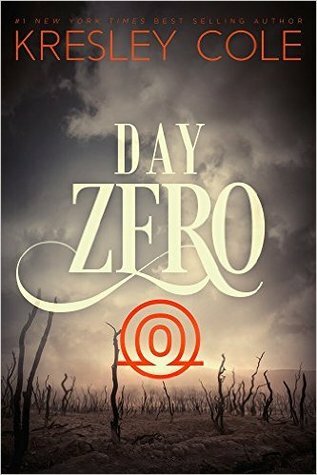 Find out who they lost, why they endure, and what they sacrificed in order to live past Day Zero. . . .
Of all the characters you know, and all of those that you’ve yet to meet. I don’t know if you need it to read Arcana Rising, (ACK.) but I’m sure some information from here will be pretty important! 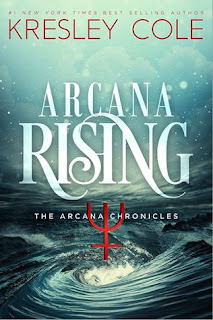 Five stars, I guess AND HELLO ARCANA RISING! HAVE YOU STARTED THIS SERIES YET? What do you think of Tarot Cards? What do you think of a post-apocalyptic immortality game with POWERS based on Tarot Cards? I can't WAIT to hear your thoughts my lovelies!